Londonist What Animals Can You Find At The Bank Of England? 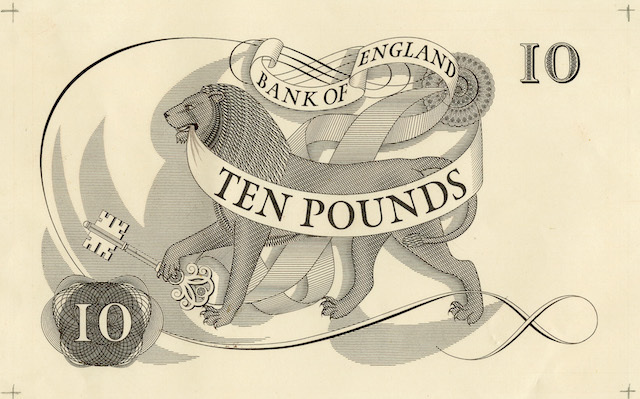 You may not think it, but there's an abundance of animals inside the Bank of England: from the lions that guard the gates to the bees — historically a symbol of industry and co-operation — which adorned banknotes throughout the 19th and 20th centuries. As the Bank of England Museum's new exhibition — Flora And Fauna — opens, curator Jennifer Adam takes us through a tour of the bank's menagerie. Despite initial impressions, today’s Bank of England is actually a relatively modern building, designed and built between 1925 and 1939 by the architect Sir Herbert Baker, assisted with decoration by the sculptor Sir Charles Wheeler. Wheeler’s scheme echoed the Neo-Classical themes that Baker’s predecessors, including Sir John Soane, had brought to the original Bank of England buildings, while bringing to the project his own distinctly modern style of classicism. The bank’s decoration follows the tradition of using design as a way of symbolically warding off bad spirits, in order to inspire the visitor with confidence in the strength and integrity of the institution. One of the first sights to greet visitors to the bank is the magnificent sculpted lions adorning the great bronze doors. Wheeler’s lions guard each of the portals into the bank, on Threadneedle Street, Princes Street, Bartholomew Lane, and the two gates on Lothbury. Such lions are part of an ancient artistic tradition: they invoke the awe of the onlooker, conjuring the strength of these mighty beasts to defend a place and ward off evil intent. Their frequent depictions around the bank, sculpted on doorways, handles, railings and decorative relief, echo ancient depictions of lions as protectors of treasure. 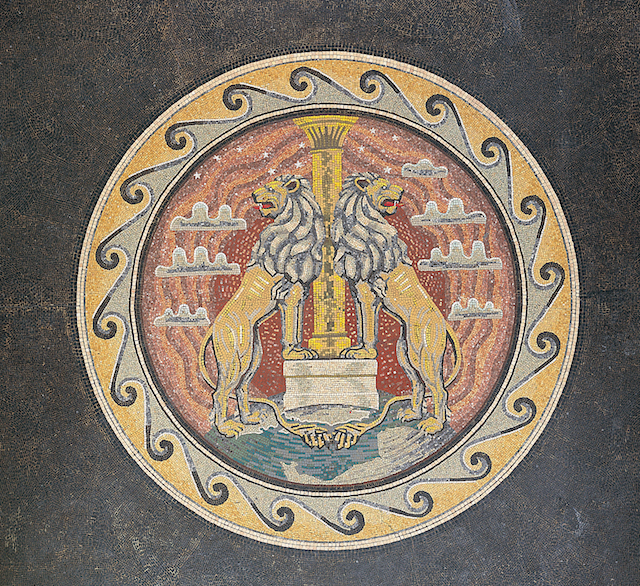 Indeed the mosaic floor of the bank’s entrance lobby copies the form of the lions that guarded the gates of the ancient Greek city of Mycenae, with two lions standing either side of a single column. The entrance on Threadneedle Street. 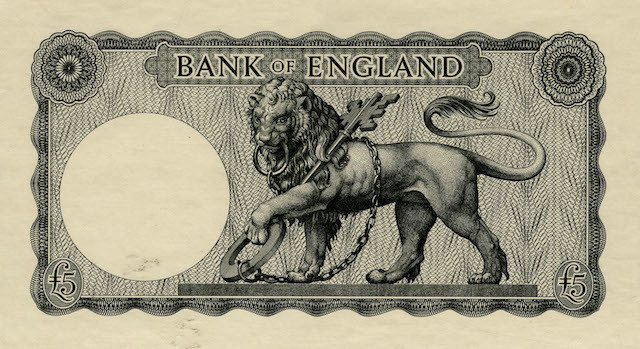 The big cats also appear on British banknote designs from the 1950s and 1960s, although some depictions are more imposing than others: the symbolism of a mighty lion holding the keys to the bank on the 1957 five pound note is quite clear, whereas his counterpart on 1964's 10 pound note looks almost friendly. As well as lions, a number of other fierce creatures feature within the bank’s walls. The Court Room was originally designed by architect Sir Robert Taylor in the 1760s and features griffins and snakes which serve a similar apotropaic function (that of warding off evil or bad luck), with several copied from designs from ancient Greece and Rome. 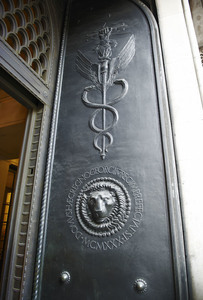 Snakes also appear in the form of the caduceus, a sacred attribute of the Roman god Mercury, known not only as the deity of messengers, but also of commerce and trade. As well as using images of imposing beasts to ward off evil intent, Classical art and architecture also made use of plant designs as a way of conveying positive attributes such as solidity, integrity and virtue. This inspired Sir Herbert Baker’s artists and craftsmen in the decoration of the new bank in the 1930s. Mosaics include designs relating to banking and finance surrounded by borders of laurel olive, and oak. These draw on ancient associations of victory and peace (laurel), wisdom (olive) and solidity and strength (oak). Test print for 1964's 10 pound note. Test print for the 1957 five pound note. While attributes of security, reliability and permanence remain important to the image of any central bank, the Bank of England’s public service remit is also reflected in aspects of design around the building. Animals add a symbolic element to a portrait in the bank’s parlours, of William Paterson, whose scheme formed the basis for the Bank of England’s foundation in 1694. Below the portrait is a relief of a pelican feeding her young: the pelican was thought to feed its offspring with its own blood, thereby becoming a symbol of self-sacrifice and the service of others. This sentiment is underscored by Paterson’s motto which comes from a verse attributed to the Roman poet Virgil, conjuring the image of bees working for the benefit of others, not themselves: ‘sic vos non vobis mellificatis apes’: ‘thus not for yourself do you bees make honey’. 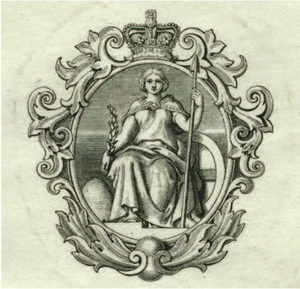 Vignette of Britannia that featured on banknotes in 1855; beehive to the left. Indeed bees appear as a symbol more than once. In 1855 the bank began issuing notes featuring a new vignette of Britannia designed by Daniel Maclise in which the pile of coins that Britannia was guarding in the first version of the bank’s seal has morphed into the form of a domed beehive. In this case bees appear as a symbol of industriousness and co-operation. As well as their symbolic uses, animals and plants have had a very real role in serving (and protecting) the bank. 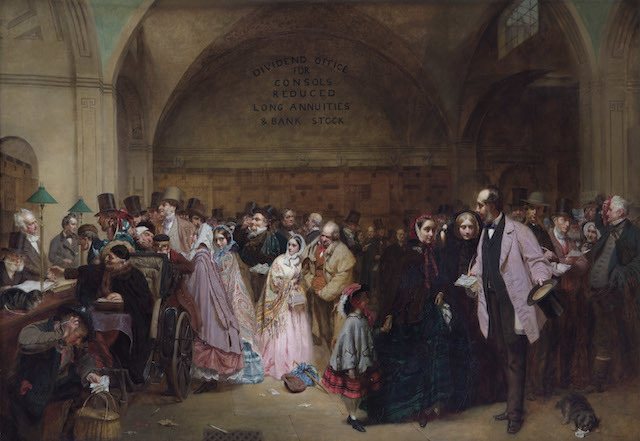 In the painting Dividend Day at the Bank of England by George Elgar Hicks, the presence of a terrier and a cat might intrigue — but were actually a form of 19th century vermin control. Watchdogs and carriage hounds are common features in paintings and engravings of the bank throughout the 18th and 19th centuries. Dogs still play an active role in maintaining protection and security in the area, although these days this responsibility falls to the City of London Police, with the specialist dog section assisting in searches for explosives or drugs, for instance. There has also been an association with the City of London Police Mounted Unit: in 2006 one of its horses was named Ariel, after the sculpture of the same name above the bank’s Tivoli Corner. Dividend Day At The Bank Of England by GE Hicks. There is also an association between the plant world and the security of currency that reaches beyond pure symbolism and into practical design. In the 18th century, printers in New Jersey experimented with forms from the natural world, copying the unique patterns of leaf veins in the hope that they could provide an inimitable security feature. Though they eventually proved possible to forge, the move towards complex printed forms was an important step in protecting currency against counterfeiting. This would develop into the complex mechanical guilloche patterns that have appeared on later note designs. In the 20th century, designers also used complex plant-inspired banknote designs to confound counterfeiters by including deliberate errors. The flowers of the 1957 five pound note contain secret marks specifically used by clerks to identify forgeries: counterfeiters might omit a seemingly random dot or mistakenly continue an apparently broken line without realising that these would be the marks that would reveal their forgery. And of course, the very material used for Bank of England banknotes — paper made from a special cotton-linen blend — is itself a plant product. Flora and Fauna at the Bank of England runs from 23 March until autumn 2015. The Bank of England Museum is open weekdays, 10am-5pm at the Bank on Bartholomew Lane, EC2R 8AH. Admission free. A longer version of this article was published in the Bank of England magazine, and can be read here [PDF].